A control-freak king, betrayed by his own family after an archbishop's murder. A friendship that collapses into civil war. A revenge-obsessed ruler, and the rise of a vicious despot. Compared to the real-life Plantagenets, the dynasty that dragged Britain out of the Dark Ages into the modern world, Game of Thrones looks almost tame. 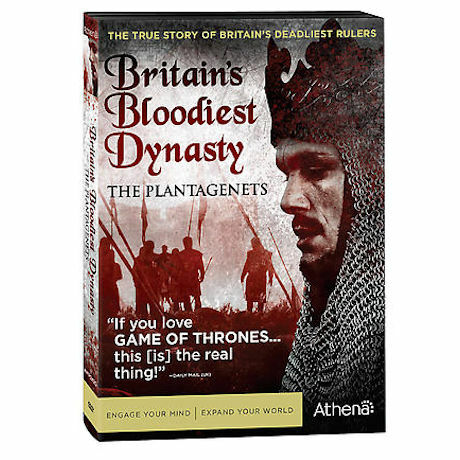 Presented by acclaimed historian Dan Jones, based on his best-selling book The Plantagenets, this roaring British docudrama is "a solid slab of history ... tasty and nutritious at the same time" (Guardian, UK). Jones calls it "big, bloody and thrilling." 4 episodes, 3 1/4 hrs, 2 DVDs, SDH, viewer's guide. From Athena.